A pretty cool app is coming next year for BlackBerry 10. 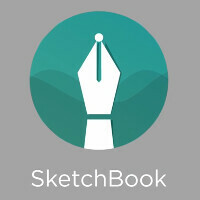 Called SketchBook, the app is, well, a virtual sketchbook. It is said to run extremely well on the BlackBerry Passport, where it takes advantage of that wide 4.5-inch 1440 x 1440 screen. You'll have a choice of writing and sketching tools including a pencil, fountain pen, marker, paint brush and crayon. You also will get to choose from a selection of colors. Just about anything you can write in a physical sketchbook can be produced using this app. And you can even use it to make to-do lists, or shopping lists. While we don't know exactly when the app will be released, you can sign up for the developer's Most Valued Customer program and receive an email when SketchBook will be live on BlackBerry World. Simply click on the sourcelink to visit the developer's website. Developed by India's ReFocus Technology, you can check out a teaser for SketchBook by clicking on the video below. This appears to be a well-designed app that BlackBerry users will find many uses for. Seriously, BB needs to step up with an active digitizer pen system like the Wacom based one on the Samsung Galaxy Note series. I sketch with it, and nothing is better than drawing with an active digitizer for accuracy and finer details, unlike with a rubber 99¢ stylus or with a finger. I'd like to see what other companies can offer than Samsung.